This article is the final one in the series addressing how nursing professional development practitioners operationalize the education design process criteria as delineated in the American Nurses Credentialing Center (ANCC) Primary Accreditation Provider Application Manual to ensure high-quality continuing education activities. Specifically, this article explores the relationship between the ANCC primary accreditation framework's educational design process criteria and the Nursing Professional Development: Scope and Standards of Practice. J Contin Educ Nurs. 2018;49(9):390–393. During the past several months, this column has explored the alignment of the American Nurses Credentialing Center's (ANCC) educational design process criteria and the Nursing Professional Development: Scope and Standards of Practice (Harper & Maloney, 2016). While the ANCC educational design process criteria ensures the quality of educational activities, the Nursing Professional Development: Scope and Standards of Practice (Harper & Maloney, 2016) delineate the who, what, when, why, where, and how of the nursing professional development (NPD) specialty nursing practice. This article explores the symbiotic relationship between the ANCC primary accreditation framework, specifically the educational design process criterion, and the NPD scope and standards. Adheres to overall purpose and licensure requirements of nursing. Fulfills a need within nursing. Possesses a unique knowledge base and competencies. Defines its scope of practice. Establishes standards of practice to which all nurses in the specialty must adhere. Formerly known as nursing staff development, the specialty practice of NPD was formally recognized by the ANA in 2000 with the publication of the specialty's first scope and standards (ANA, 2000). As shown in Figure 1, NPD as a specialty is at the core of the ANCC's primary accreditation conceptual framework. American Nurses Credentialing Center (ANCC) Conceptual Framework. From Nursing Professional Development: Scope and Standards of Practice, (3rd ed., p. 10), by M. G. Harper and P. Maloney (Eds. ), 2016, Chicago, IL: Association for Nursing Professional Development. Copyright 2016 by the Association for Nursing Professional Development. Reprinted with permission. The specialty organization for NPD is the ANPD. Founded in 1989 as the National Nursing Staff Development Organization, the specialty organization changed its name in 2012 to more closely align with the specialty practice (Harper & Maloney, 2016). The ANPD has over 4,500 members, and its mission is “to advance quality health care by defining and promoting NPD practice” (ANPD, n.d., para. 3). As the specialty organization for NPD, the ANPD oversees the ongoing review and update of the Nursing Professional Development: Scope and Standards of Practice, which, according to the ANA (2017), must be updated every 5 years to stay abreast of the changing health care environment. Advocate for the NPD specialty. 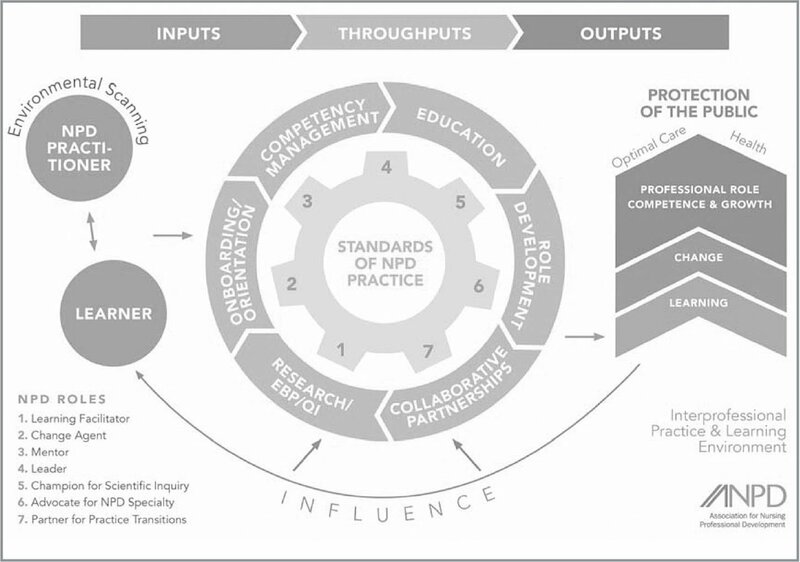 Although the learning facilitator role is most commonly associated with the NPD practitioner, the other six roles are equally as important as demonstrated in the NPD practice model shown in Figure 2. From Nursing Professional Development: Scope and Standards of Practice, (3rd ed., p. 10), by M. G. Harper and P. Maloney (Eds. ), 2016, Chicago, IL: Association for Nursing Professional Development. Copyright 2016 by the Association for Nursing Professional Development. Reprinted with permission. In the role of learning facilitator, the NPD practitioner “uses the educational design process to bridge the knowledge, skills, and/or practice gaps identified through a needs assessment” (Harper & Maloney, 2016, p. 16). 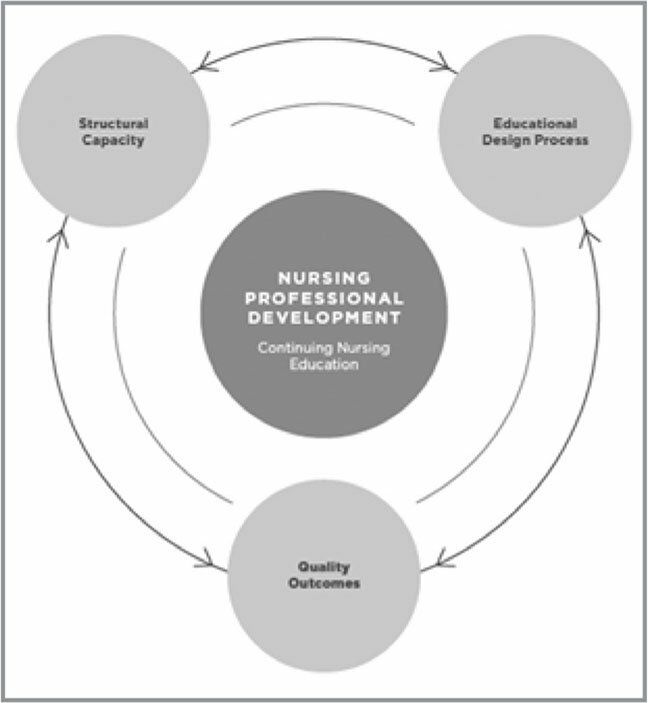 As demonstrated in previous articles in this column, standards 1 to 6 of the Nursing Professional Development: Scope and Standards of Practice (Harper & Maloney, 2016) align with the educational design process (EDP) criteria of ANCC and are used when developing continuing nursing education activities. Although on the surface it appears that the NPD practitioner intersects with the ANCC (2015) EDP criteria only in the role of learning facilitator, in reality, the NPD practitioner uses the EDP criteria (EDP 1 to 7) in all seven roles, as demonstrated in Table 1. Research and evidence-based practice/quality improvement. These six roles have fondly become known as “The Big 6” in NPD circles (Price, 2017). As with the NPD roles, NPD practitioners align their practice with ANCC EDP principles as they perform all their responsibilities, as shown in Table 2. The resulting outputs include learning, change, and professional role competence and growth that promote optimum care and promotion of health, ultimately resulting in protection of the public. The ANA recognizes NPD as a distinct nursing specialty as a result of the specialty meeting multiple criteria (ANA, 2017; Harper & Maloney, 2016). The ANPD, the specialty organization for NPD, accepts responsibility for the ongoing updates of Nursing Professional Development: Scope and Standards of Practice (Harper & Maloney, 2016). NPD lies at the core of the ANCC accreditation framework consisting of three criteria—structural capacity, EDP and quality outcomes. This column has specifically addressed ANCC EDP criteria (EDP 1 to 7) and demonstrated their incorporation into all the roles and responsibilities of the NPD practitioner. This symbiotic relationship ensures high-quality continuing professional development to promote optimal patient care and health. American Nurses Association. (2000). Scope and standards of practice for nursing professional development. Silver Spring, MD: Author. Harper, M.G. & Maloney, P. (Eds.). (2016). Nursing professional development: Scope and standards of practice (3rd ed.). Chicago, IL: Association for Nursing Professional Development. Dr. Harper is Director of Nursing Professional Development, Association for Nursing Professional Development, and Dr. Maloney is President, Association for Nursing Professional Development, Chicago, Illinois, and Senior Lecturer, School of Nursing, University of Washington Tacoma, Tacoma, Washington. Address correspondence to Mary G. Harper, PhD, RN-BC, Director of Nursing Professional Development, Association for Nursing Professional Development, 300 North Wabash Avenue, Suite 2000, Chicago, IL 60611; e-mail: mharper@anpd.org.